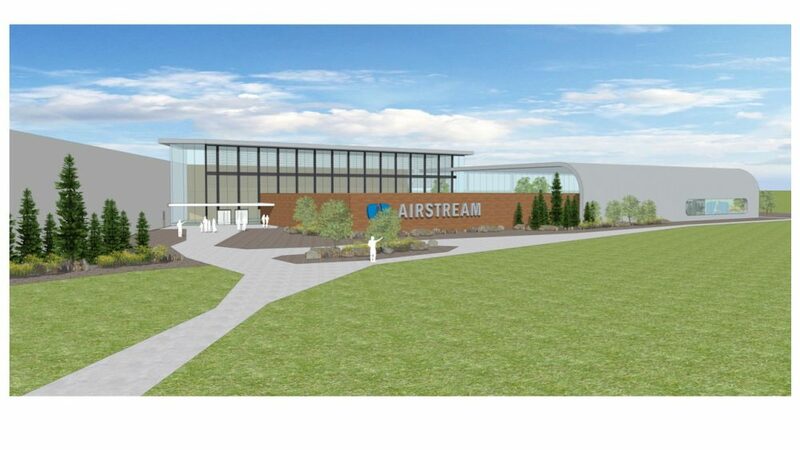 Jackson Center, Ohio (February 26, 2018) – Airstream, Inc., manufacturer of the iconic “silver bullet” travel trailer and subsidiary of Thor Industries (NYSE: THO), is poised to break ground on the most significant plant expansion in company history. The enhanced Jackson Center facility will support improved product quality, create jobs, enable increased production, and improve experiences for Airstream associates, customers and visitors. The $40 million project to create a new 750,000 square-foot facility, which will also be completely powered by renewable energy credits, is set to break ground in late spring 2018 with completion expected in 2019. This expansion is the latest example of Airstream’s long-standing commitment to continuous innovation, quality control, and its Made in America philosophy. As a result of this investment, the craftspeople at the heart of Airstream’s assembly process will have more production space to make the world’s most iconic recreational vehicle. The plant expansion will consolidate multiple production spaces into one facility, bringing the assembly of the company’s travel trailers under one roof. The current 255,000 square-foot travel trailer plant will be converted for use building Airstream’s motorized touring coaches, freeing up production space to support a growing line of products that appeal to a broad spectrum of RV enthusiasts. As a result of the expanded capacity, Airstream expects to hire additional associates, bringing total employment in Jackson Center to around 1,200 people. A state-of-the-art training center in the new factory will provide Airstream and dealer associates with a hands-on shop floor environment for earning certifications, learning new skills, and mastering new production and maintenance techniques. All of this is designed to improve the experience of Airstream customers. Airstream’s expansion will provide another boost to the Dayton economy, which saw approximately $1 billion in capital investment last year. Local employers like Airstream are responsible for some 80 percent of the region’s recent economic growth, and they’ve helped raise the median wage in Shelby County to above $54,000 a year. “In every way possible, the resources of the Sidney-Shelby County Chamber are committed to helping Airstream continue its growth and prosperity,” Raible said. Airstream’s current Jackson Center facility has long been a popular destination for Airstream owners and other tourists seeking a glimpse inside the company’s hand-made manufacturing process. A new Heritage Center will enhance those visits with exhibits illustrating the company’s 87-years of inspiring adventure and help drive regional tourism in nearby communities. Plans call for the display of numerous classic and historic Airstream products, including artifacts from the relationship between Airstream and NASA’s space program. Airstream began operating in Jackson Center, Ohio in 1952. The current plant was built in 1971. The Jackson Center campus has been Airstream’s sole manufacturing location since 1979.